Trent and Jennifer’s wedding was an absolute blast to shoot. We always love getting to be a part of a wedding that is family focused. When we met Jennifer, she made us aware that most of her family would be flying in from out of the country. As we soon found out – Trent had an absolute huge extended family as well. That made for a giant wedding ceremony and reception party. These two sure did it right for their wedding. We started our day at the beautiful Reflection Bay Golf Club. This venue is still fresh for Las Vegas and was recently completely reinvigorated with a massive overall. 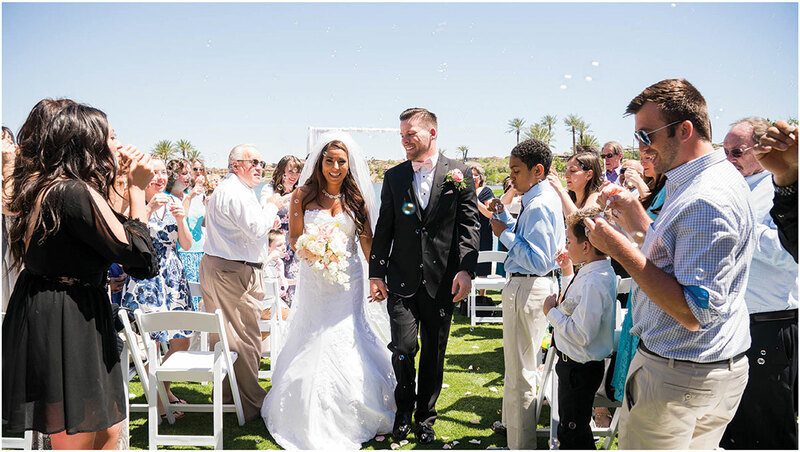 The property features one of the best beach ceremony locations in town. We made it a point to run up to the top of the Club House to grab a quick aerial shot of the ceremony site. Trent works in the audio-visual field so he provided all the audio for the ceremony site. He was outside when we arrived on site setting it all up. Leave it to him to be working on his wedding day! Some of my favorite highlights from the ceremony were their fur babies coming down the isle, Trent’s nephew giving us the thumbs up, and a wonderful bubble exit. One of the highlights of Reflection Bay is their beautiful palm trees. Jennifer loved that we could place them as the background for most of their family session. They had a huge family so it was great that they all listened and had fun while we did the session. After we finished our main family and wedding party shots we hit the road. We went down to the Montelago Village for some photos of the wedding party. Moving locations allowed us the chance to get a lot of different looks for their wedding party. The party size was large so while we photographed the girls, the boys went to Son Risa Grill for a drink and some food. The only problem was that the food came just as the girls arrived to switch places. We wanted to keep the sessions fun and not make it too serious. With that in mind we played around, had fun with it, and did a bunch of different looks. We always think it is important to get as many different shots as possible with everyone who is involved in the wedding. After the wedding party was all finished up, Trent and Jennifer took a private limo down to Caesars. Jennifer even took a minute to fall asleep on Trent’s lap. The best part is the whole way we drove Trent took every care to block the sun from her eyes so that she could sleep the whole way. We always love to stop at the Strip, it allows some special and unique shots to be captured. The most important thing is to plan enough time to get in, out, and to your reception on time. We had originally planned for two locations, but as our timeline started to get a little crunched Trent and Jennifer agreed that one location would be enough at the Strip. Trent and Jennifer’s reception was at the spectacular Sam’s Town Live. Not too many people have a large enough party to justify renting this amazing space, but they nailed it. The amazing thing at the reception was that the venue had a live video playing on the screen during the toasts and dances. It was like going to a concert, except all the main players are your family and friends. It was masterfully done. The giant shrimp bar and classically cute candy bar were complete winners at the wedding. Trent had worked up his own fog machine to get maximum coverage on the dance floor. We think he might have gone just a hair over kill on it lol. 1. Always plan enough time for travel if you are shooting in multiple locations. 2. Hire a day of planner if you are using multiple venues at multiple locations. 3. Book a two photographer team if your wedding has over a 100 guests.